Artisans may have thought that, unlike many other markets, there was no avenue for machines to take over their ethereal reins. After all, something soulless doesn’t have the most important component for creation of artistic expression: Human emotion. But arts fields from culinary to fine art, to dance, theater, and film, have all made advancements in incorporating machine learning in their crafts. Recently, the first piece of credited AI artwork, a painting titled “Portrait of Edmond de Belamy” was auctioned off by Christie's for over $430,000. The painting, that resembles a man dressed in a dark frock coat, was set in motion by software developer and “Robot Artist” Jeremy Krabil. He sees the output as a way of expressing himself through computer code, while admitting that on his own, he does not have the technical skill to be a successful artist. So, can he really be seen as the originator of the art when a machine was the true generator of the piece? The programs that create the art are complex, but ultimately it is a process that requires a machine to learn in order to engender something “creative.” On the other hand, it is programmed to create something artistic, so is the painting then the expression of its designer? Christie’s thinks so anyway, and awards the money to Krabil for the creation of this piece. In simplistic terms, AI art is mostly created by using generative adversarial networks (GAN). GAN consists of two machine intelligences that work against each other to create a final piece. These twin machine minds, working in opposition are known as the generator and discriminator. When a large data set is given to the GAN, the generator creates random objects (or sounds or whatever wants to be created). The discriminator then takes these sounds and matches them to artistic images that exist in the data set. Basically it is learning from precedent and then creating its own expression based on the connection between the chaotic mind and the analytical. It might be said that this is what humans do to create as well, connecting the analytical left brain with the more creative right. So, in that sense, what might be considered the difference between human and machine created art? IS ART IN THE EYE OF THE BEHOLDER? Indeed, at the Rutgers Art and Artificial Intelligence Lab (AAIL), they have been running experiments to see if audiences can distinguish between paintings created by humans or machines. After hours and hours of exhausting programming, the machine at Rutgers has been able to create paintings that can fool critics into believing they are human created abstract expressionist works. After initial set up, says Professor Ahmed Elgammal, the AI can create their own art without the input of any human programmer. Elgammal sees it as a breakthrough in artistic creation, but does it have any more aesthetic relevance than attaching a pencil to a pendulum and giving it a nice push? Some may say that art is not dependant entirely on what audiences take away from a piece. Instead, it depends on a definition of art. 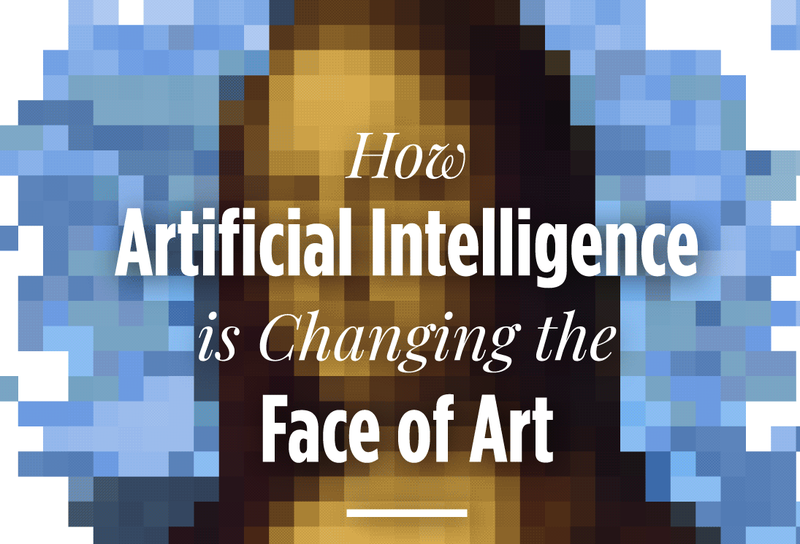 An article from Medium, decries the idea that AI can create art, impling that inherent in the meaning of artwork is the idea of a human intention. It stages then an appreciation of art is, in fact, only relegated to appreciating aesthetics created by humans. After all, one doesn’t look at the grand canyon or a snowflake and consider it art, even though it may be beautiful or evoke emotion. Part of art, it might be argued, is that has to be created with human intention behind it. Does this mean that AI artwork is forever relegated to being not-art? Like the centuries old innovation of canvas taking over from wooden painting surfaces, many artists see AI as a simply tool that artists can use to augment and enhance their pieces. They argue that they use machine learning to create advancements in artistic expression that would not have otherwise been possible. For example, photographer Anna Ridler uses AI to create videos of blooming tulips, chosen by AI from her thousands of photos of of the flower. In literature, the writer and programmer Ross Goodwin uses AI to create fiction, poetry and screenplays through an algorithm that predicts language patterns. In one instance Goodwin used the visual, sonic and locative input found during a road trip in a car to let a machine “write” a travel narrative. The resulting book 1 The Road is clearly inhuman but still intriguing. “When you read it,” says Goodwin, “you are becoming the author, because there’s no human intent behind the words.” Goodwin implies that the resulting work is a true mesh of man and machine. “You get to project meaning onto [the words]. The reader becomes the writer,” Goodwin says. In music, AI is being used to create royalty-free music for video projects. And instead of shying away from the possibility that machine intelligence is taking away their expression, some musicians, like pop artist Taryn Southern, are finding ways to embrace AI. Southern used an open source AI platform called Amper to help produce her debut album I AM AI. She sees it like being a songwriter who works with a team of musicians to create a piece. “The way it works,” says Southern, “is to give the platform certain input like BPM, instrumentation that I like, genre, key, etc. The platform will spit a song out at me, and then I can iterate from there, making adjustments to the instruments and the key.” In this way she can create the song she wants without dealing with a room full of potentially argumentative collaborators. A play series at the Philadelphia based theater company, Simpatico Theater is using AI to create new pieces based on the work of extant playwrights. Local writers have had their oeuvre fed into an AI, and it produced new work that tries to match their voice. Results have be interesting (if very jumbled) and their night of theater has found a large and excited audience. Celebrated director Annie Dorsen similarly created a work called “Hello, Hi There” which pits two of the greatest minds of the 20th century, Michel Foucault and Noam Chomsky, against each other as chatbots. The result created an award-winning drama that is different every night of performance. Lauded British choreographer Wayne McGregor has begun trying to teach AI to dance. He has given an AI-driven machine video of a massive number of hours of his choreography until the machine has learned to predict movements and gestures. GIven this vocabulary of dance, the AI can now choreograph on its own and recreate the McGregors distinctive style in a new and surprising way. Even the culinary arts have been infiltrated by Artificial Intelligence, proving it does not take having taste buds to learn to cook. After analyzing chemical signatures in food, Chef Watson, created by IBM, can sift through thousands of flavor profiles all at once to create taste combinations and recipes based on a person’s preferences. The hope is that in the near future, Watson will be able to create the most appealing health-conscious dishes designed for individual palates. While some experiments of the crossover of AI and art have been celebrated for their uncanny resemblance to human expression, some are being touted for their unique naive and odd quality. In 2016, Ars Technica Director Oscar Sharp with the help of Ross Goodwin created a film written entirely by an AI that named itself Benjamin. The AI was fed a plethora of 80’s & 90’s science fiction scripts with the goal of letting it come up with its own narrative. Then the team behind the film gave it a series of prompts to aid in its storytelling. The resulting film, entitled “Sunspring” was to be shot in just 48 hours and included HBO’s “Silicon Valley” star Thomas Middleditch. Overwhelmingly, audiences saw “Sunspring” as a kind of glorious failure. The machine clearly didn’t understand syntax, intention, or plot structure of any kind. However the result was also touted as more than the sum of its bizarre parts, eliciting emotional performances from its human actors. There are parts of the film that (even though the dialogue is disjointed) approach genuine pathos. Ars Technica, followed up in 2018 with a film that was written, directed and starred the AI Benjamin entitled “Zone Out”. To accomplish this they fed the machine stock film footage, actor expressions and dialogue from many films that were in public domain. Again the results are clearly inhuman and do not resemble anything that a living director or writer would likely create. But many continue to appreciate the piece as one that comes from what they see as fledgling form of artistry that is learning to find its footing. One thing is certain, there is no putting the machine learning genie back into the bottle. Future artists will need to at least be cognizant of the ways in which AI can potentially be used in their aesthetic work. Below, Invaluable has created a comprehensive list of ways that computers are entering into the artistic sector that has a clear message: If artists want to stay relevant, they may be forced to join forces with machines in some capacity. After all, soon you may not be able to tell if the author of your book, or the music you listen to was created by a human or a bot.